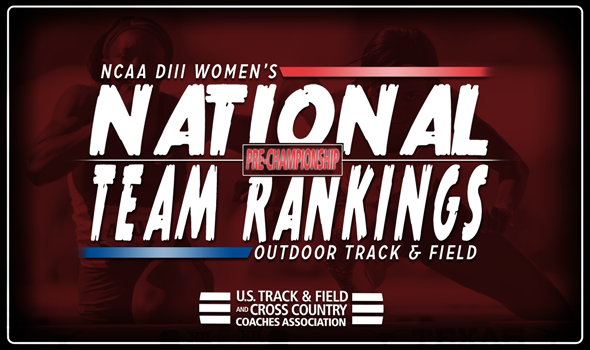 If the Women’s National Team Rankings have any say in the matter, a team is poised to win its first national title in program history. Claremont-Mudd-Scripps returns to the top of the rankings at the most important part of the season and justifiably so. The Athens own five entries that are ranked in the top-5 nationally, including a pair of top-ranked marks: Tyra Abraham in the 100 and Emily Bassett in the hammer. Abraham is expected to score big points for CMS in the 200 as well. Williams jumped six spots from Week 7 to Week 8 and occupies the passenger seat. The Ephs have seven entries ranked in the top-10 nationally, of which include Emma Egan, Helene Hall and Summer-Solstice Thomas in the high jump at No. 1, No. 2 and No. 4. This is the highest ranking this late in the season in program history for Williams, which finished on the podium just once since 2010. UMass Boston, the indoor champion, remained at No. 3. The Beacons have All-Everything star Wadeline Jonathas, who will compete in three events at NCAAs: 200, 400 and the long jump. Jonathas will be joined individually by Taylor Driggers, who is ranked in the top-10 nationally in both horizontal jump events. Former No. 1 UW-Eau Claire dropped to No. 4 in the Pre-Championships Rankings. The Blugolds could see at least 20 combined points in throwing events from Erica Oawster (No. 1 in the discus, No. 3 in the shot put) and JoHannah Theisen (No. 5 in the shot put). George Fox comes in at No. 5 and is a serious threat to make the podium. The Bruins have the top-ranked heptathlete in the nation (Annie Wright) as well as the top-ranked 4×100 relay. Here is the rest of the top-10: No. 6 Whitworth, No. 7 Washington (Mo. ), No. 8 Emory, No. 9 Ohio Northern and No. 10 MIT. Of note is Emily Richards for the ninth-ranked Polar Bears: Richards will double in the 800 and 1500 in the final meet of her collegiate career and is the NCAA DIII record holder in the former and sits No. 3 all-time in the latter.